PREMIUM PRACTICE FOR A PERFECT 5! Equip yourself to ace the NEW 2017 AP Calculus AB Exam with this Premium version of The Princeton Review’s comprehensive study guide, fully updated to reflect changes to the 2017 test. 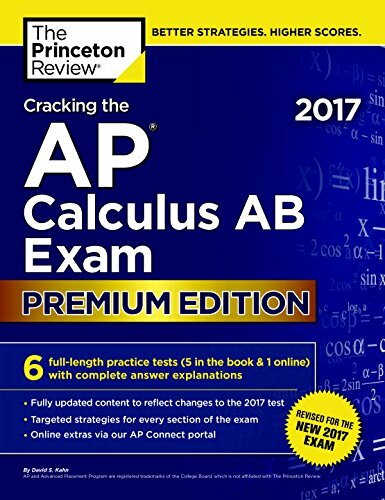 In addition to all the great material in our classic Cracking the AP Calculus AB Exam guide—which includes thorough content reviews, targeted test strategies, and access to AP Connect extras via our online portal—this edition includes extra exams, for a total of 6 full-length practice tests with complete answer explanations! This book provides the most practice at the best price (more tests than any other major offering currently on the market, at a price that’s 20% less than the nearest competitor). Premium Practice to Help Achieve Excellence.